All iPhone models have a rather interesting way to “Undo” or “Redo” typing in iOS and in every single app… get ready for it because it’s probably not going to be what you expect: you shake the iPhone to undo and redo typing. 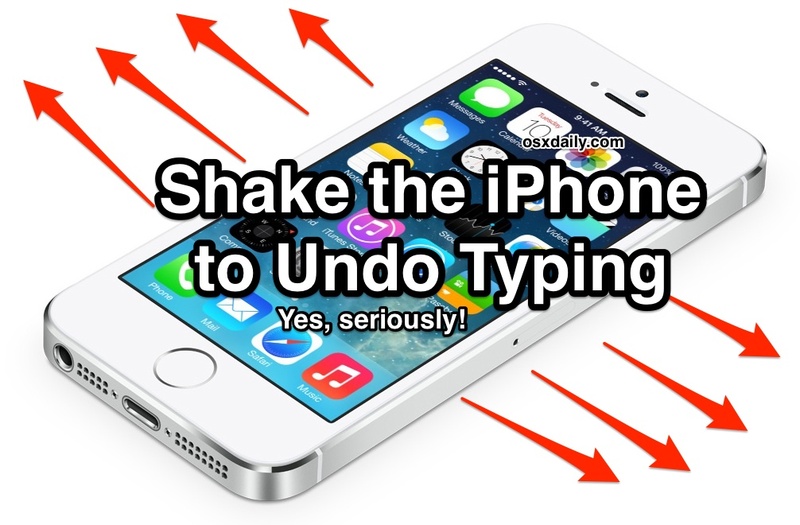 Yes, seriously, physically shaking the iPhone initiates an “Undo” or a “Redo” making the action buttons for each task visible. These can undo/redo anything, whether it’s typed text, copying, pasting, deleting text, basically whatever the last action was it will figure out. A friend of mine thought I was joking when I showed this to them, so it’s important to emphasize this is actually how you undo/redo on the iPhone. There are no Undo / Redo buttons like there is on the iPad keyboard until the physical jostling action has been triggered. Yes, the shake motion does work on the iPad as well, but waving around a 1lbs piece of glass and aluminum is probably not the best of ideas. Sometimes you have to be fairly abrupt with the shake to get the feature to trigger, and usually one or two quick jolts isn’t enough, so what I like to recommend is giving it a good shake as if you were making percussions sounds with a maraca or a rattle. Shake-to-undo and Shake-to-redo works in any place where you have inputted text, and it’s basically the iPhone equivalent to the oh-so-popular Command-Z and Command-Shift-Z keystrokes to undo/redo in Mac OS X. Admittedly this is a bit goofy at first, but once you get the hang of it it’s actually quite cool and very intuitive. Just give it a few tries, you’ll pick it up quickly. This trick does require a functioning accelerometer, which is a hardware element in almost every iPhone that detects physical motion of the device. For nearly every single iPhone it works as intended, but if your iPhone has suffered some sort of damage the accelerometer may not work at all. As of now, there is actually no alternative method to perform the Undo function or Redo function on an iPhone or iPod touch, but as mentioned before, there are undo and redo buttons on the iPad keyboard. So it appears the rather unusual shaking method for the iPhone and iPod touch is here for the long haul. Be sure to check out more iPhone tips here. Yea, count me in as one of the probably millions who thought someone was yanking my chain when they told me this. I get that it’s quirky, whatever, but it’s not the most intuitive thing in the world. Would it kill Apple to have a button to do this accessible with a tap-and-hold? Or like the iPad, have it on the extended keyboard? I’d like an undo keyboard option as well, but presumably because the iPhone keyboard is quite small it would be difficult to place it somewhere. It’s intuitive to those of us who grew up with Etch-A-Sketches. My first gen iPad mini does not have undo/redo buttons on its keyboard (AFAICS), though it does respond in the described manner to a shake.